Merry Pet Washroom: I love my cat. But the litterbox is an eyesore. There just isn't a good place to put that thing, you know? I saw something like this in Skymall once, and decided that if I could get it for the right price (about $60 once I shopped around), it might be good for my apartment. I found this "washroom" for Cally to be easy to put together and WAY better in looks than the old litterbox. It looks like furniture right? Two thumbs up... I recommend a litterbox with high walls to place inside, to keep it from getting too messy in there. 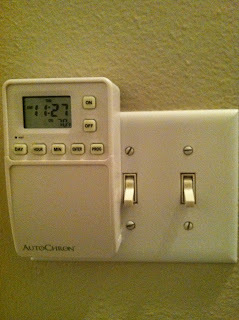 Autochron Automatic Wall Switch Timer: My apartment doesn't have a security system, and so I like to make it look like I'm in my apartment even when I'm not. 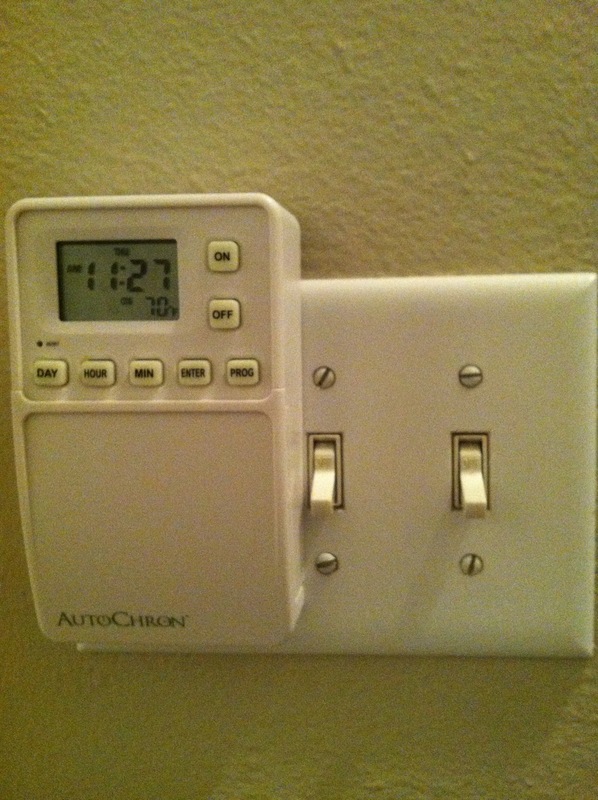 So I bought a pair of Autochron timers on Amazon to install for my porch light and living room light. LOVE IT. It goes over the switchplate (i.e. no wiring) and is powered by battery. The mechanism that flips the switch is a bit loud, but I love the programmable switch for when I'm traveling. It's way better than a lamp timer, because this switch uses lights that people would assume you can only turn on from inside the apartment. I don't know why, but this definitely makes me feel a bit safer! That cat thing is hysterical, and I just sent the link for the wall switch timer to Dave. We have to leave our porch light on all day because its dark when we get home - this would be great! Reviews are mixed, but mine are working fine right now. So easy, even little ol' me was able to install them quickly! They are battery powered and a little bulky looking, but they give me a little feeling of security when I'm away traveling.